This professionally decorated Luxury Log Cabin sleeps up to 10. Perfect for family reunions or corporate retreats. Finders Keepers features 4 bedrooms and 3 full baths, a large fully equipped kitchen, game room with pool table. Bring your favorite DVD’s to enjoy in your very own private home theater with a 9 foot screen and surround sound. Finish your day with a glass of champagne in your very own hot tub or on your private screened in porch! The adults can gather on the main level while the kids shot some pool upstairs in the game room. Or perhaps gather as a family in your own leather reclining theater seats and watch a movie on the 9 foot theater screen with surround sound. An experience you might not forget! Relax in your private hot tub on the lower level covered porch. With so many things to do, you may not want to leave. Cook in cabin meals in your full kitchen and enjoy the convenience of a gas grill just outside the dining area. Eat outside on the covered deck with screened in porch or dine inside on the custom made cedar log table with benches. Catch up while using the free wireless for longer stays there is also a washer and dryer in the unit for your convenience. CollapseRanked #1 by visitors in Gatlinburg, our cabins are less than 5 years old and feature rustic luxury and high end amenities. We pride ourselves on prompt customer service and maintenance should you require assistance during your stay! You'll feel the personal attention of a private home while getting the service and support from an established and professional owner. Gatlinburg can be a little busy! This cabin is located in the Arts and Crafts community which is just 8 minutes from downtown and 10 minutes to Dolly-wood. So you are convenient to everything but in a unique and secluded area. Bordering the Great Smoky Mountains National park you can enjoy the wooded seclusion while being just minutes from all the attractions. Or, tour over the 100 artisans in the arts and crafts community just 2 minutes away! 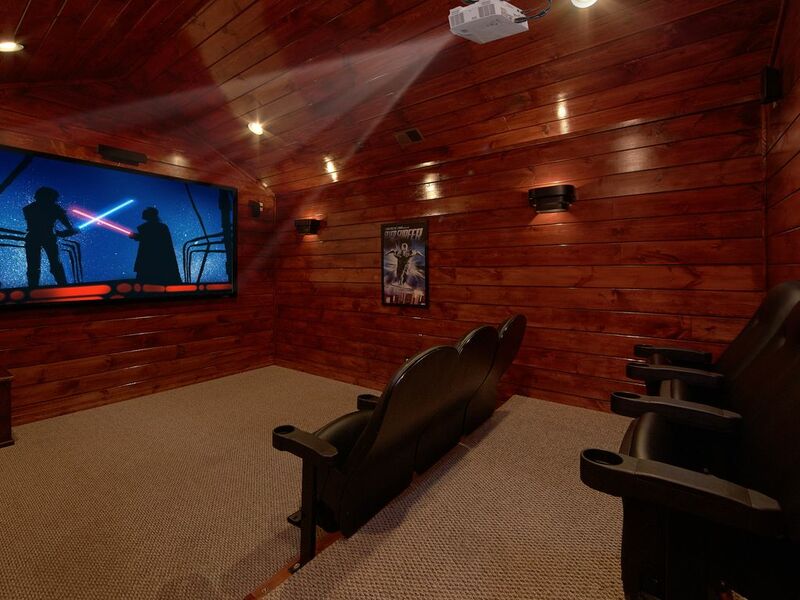 Your own private theater room with 9 foot theater screen and surround sound! A secluded location in the historic arts and crafts community your minutes away from restaurants and over 100 artisans personal studios open to the public. Just 8 minutes to downtown Gatlinburg, 5 minutes to the food city grocery store and only 10 minutes to Dollywood. All these conveniences while still being in a wooded secluded national park like setting. It was our pleasure to provide you with 5-star luxury accommodations during your recent cabin stay, Sontia. Finders Keepers is a great cabin with lots of wonderful amenities for everyone to enjoy throughout their stay! As you mentioned, this cabin is in the ideal location also. It is on a peaceful mountainside, but only a short drive to the heart of downtown Gatlinburg and The Great Smoky Mountains National Park. We really enjoyed having you as our guests, and we look forward to working with you again soon. Remember, as a repeat visitor you will save 10% on future stays. Thank you! It was a great get away with my family , the kids enjoyed the entire cabin , so spacious and convient. I recommend this to anyone with a family and kids or just adults looking for fun. Thank you for allowing us to be a part of your family's vacation, Justin. We certainly agree! Finders Keepers is truly the perfect cabin for a group or family gathering. It is full of top-notch amenities for everyone to enjoy, and the location is perfect for accessing downtown Gatlinburg or The Great Smoky Mountains National Park. We appreciate all recommendations, and we hope you too will make plans to visit with us soon. Please keep in mind, as returning customers you will enjoy 10% off all future bookings. Hurry back, new memories are waiting to be made! I was informed when I checked in that the dryer in the cabin was broken and they were waiting for a part which arrived 4 days later. Knoxville is just an hour away and someone should have picked up the part and repaired immediately. There were eleven of us going through at least 2 towels a day plus 5 were teenage girls who washed their long hair daily so another towel needed. We all loved the hot tub and dreaded reaching for a cold, wet towel. We were provided with extra towels and I also took additional ones but what do you do with piles of damp and used towels? There were 4 bedrooms and only one closet in the cabin so suitcases, shoes, winter coats and clothes were in every available spot on the floor and we were careful not to put the used towels on the carpet, wood floors, beds or furniture so it was a very chaotic 6 days dealing with wet towels until the management picked them up for us. Not such a pleasant family reunion. We loved the cabin and all of the amenities (that worked) but management left much to be desired. They had no concept whatsoever what our situation was even though I called them daily. We will not be renting from Elk Springs Resort or recommend it to anyone. Oh, BTW, we were paying $85 a Day Per Person=$5,000 for a cheap hotel experience. Thank you for taking the time to share your experience with us, Janice. We are sorry to hear you experienced this issue during your stay. We would like to assure you, if the dryer motor would have been available, we would have gladly driven an hour or longer to pick it up. That certainly was not the case. We did have to wait for the part to come in, as this part is not available locally. We use many different vendors and can also assure you, every effort is made to find parts locally prior to ordering, as this can cause delays. We do see that it was installed immediately upon being received. We do understand this was an inconvenience, however, we did exchange wet towels for clean ones each time you requested this. We work hard to take care of our guests. We sincerely apologize for the inconvenience this caused and hope you were able to enjoy your stay in light of this issue. We do understand your frustration, and can assure you our representatives went above and beyond to assist you. Please keep in mind, this was a 5 night stay over a holiday, and while the dryer was not working, this was the only amenity that was not working at the cabin. We had a great visit. Good place to accommodate hig family. Thank you for your wonderful review, Jeffrey! We are happy to hear your stay was exceptional. We enjoyed having you as our guest and hope you will consider staying with us again in the future. Please keep in mind, as a returning guest you will enjoy 10% off all future stays. Hurry back, new memories are waiting to be made! Outstanding! The entire family loved the cabin! As always, we love hearing about great family experiences with our rental company. It sounds like you chose the perfect cabin! Finders Keepers if definitely full of top-notch amenities for the entire family to enjoy. We hope you will make plans to stay with us again on your next trip to The Great Smoky Mountains. Hurry back, new memories are waiting to be made! The grandkids enjoyed the theater room. Nice, clean cabin. Thank you for your wonderful review, Mark! We are happy to hear you enjoyed your stay and hope you will visit again soon.